MuxLab’s new 4K AV over IP Transmitter makes it easy to stream 4K AV anywhere. The MuxLab IP transmitter allows users to access content, switch sources, create video walls and more with the simple touch of a button. They even have the option of creating distributions of virtually matrixed displays and massive video walls which support multi-views. The solution boasts exceptionally low bandwidth requirements, with less than 200ms latency in low latency mode when streaming. 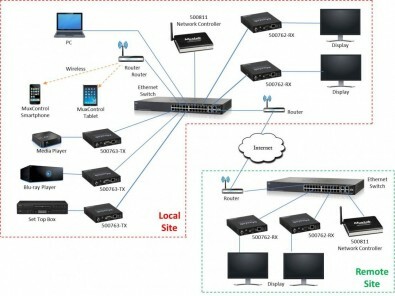 Because the system's scope is only limited by network bandwidth, users have ultimate scalability at their fingertips, with hundreds of sources and displays which can be integrated into the same system. Application Diagram. Click to enlarge. Connecting to a network from up to 100m in distance, each transmitter uses a standard CAT5e/6 cable. Once on the network, content is delivered to one, a few or multiple displays through MuxLab’s H.264/H.265 Receivers (model 500762). Video may be up-scaled to [email protected] from [email protected] or [email protected] for beautiful imagery, and two channel audio is embedded riding alongside HDMI to the display or can be extracted at the Receiver. The HDMI over IP H.264/H.265 PoE Transmitter, 4K/30 eliminates the need for dedicated cabling systems while PoE eliminates additional power supplies at local and remote locations. It can also send H.264/H.265 video streams to other H.264/H.265 compatible receiving devices. When used with MuxLab’s ProDigital Network Controller (model 500811), every piece of equipment can be managed, accessed and controlled from anywhere using a laptop, smartphone or tablet. Available for both iOS and Android, the new MuxControl App increases mobility with intuitive control. Notably, this system can also be integrated with third party Apps, and controlled via traditional RS232 and bi-directional IR.